I saw this wheat field from road when I was photographing the Dark Hedges and decided a to capture it in a wide pano. 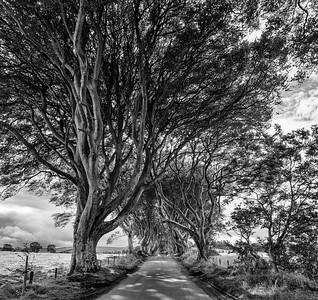 Black and White photo of The Dark Hedges looking southeast. This is a popular tourist spot to so if come in the middle of the day (like I did) expect other people around stopping and taking photo's (including buses).